The Coin Harvey Bedroom… for the man that brought the 1st vacationers here because he thought our area was so beautiful! The Ozark Mountains are steeped in a rich history. This area, once known as Silver Springs, caught the eyes and heart of a man that visited once and returned to build one of the first Vacation Rentals for our country … The Resort at “Beautiful Monte Ne” Arkansas. There’s a book and DVD about William “Coin” Harvey on the shelf. Located in the back of the cabin, this bedroom is dark and peaceful. There is abundant space in the walk-in closet to unpack your suitcases. You can also use the drawers in the antique roll-top deck. Grab a book off the shelf and read by the light of the Antique Hobnail Lamps above the headboard. Fall asleep in an antique Rice bed on a queen pillow top mattress as the ceiling fan gently stirs the air. 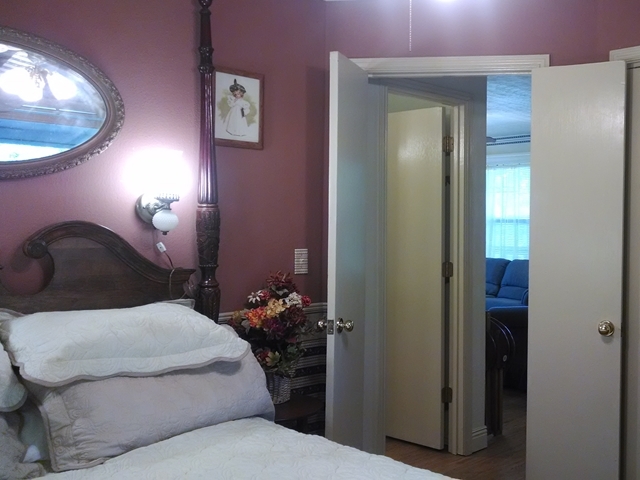 The custom medallion under the ceiling fan is quite unique. If the weather is warm you can turn on the AC or the pedestal fan. You’ll find extra pillows and bedding in the closet.